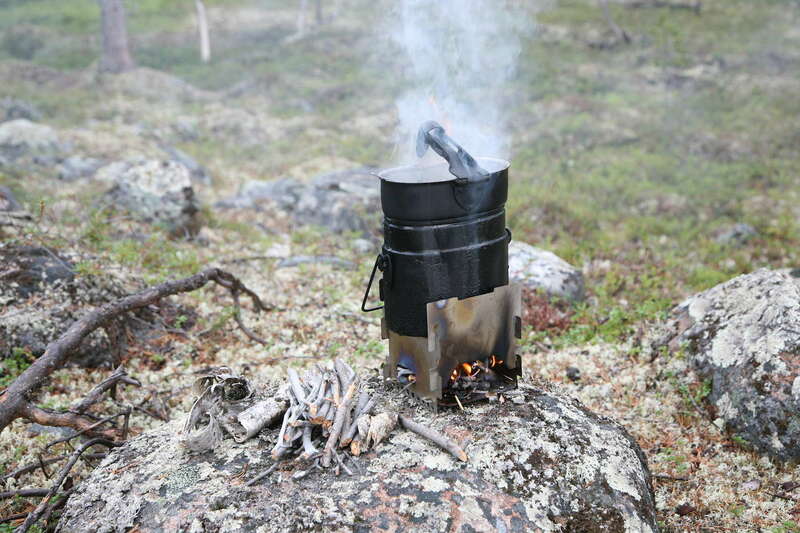 This stove weighs approximately 100 grams and takes practically no space at all. It is made of titanium, which is lightweight for its strength, and can withstand the high temperature of a wood-burning fire. Aluminum would also do fine, but it melts too easily. It packs away flat, and is assembled in a minute. 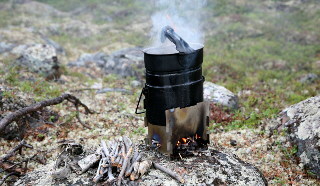 The stove has four walls and a raised bottom, and is designed to be used with a pakki, a tall, slightly flat cooking pot popular among Finnish hikers. I think it's called a "mess kit" in other languages? 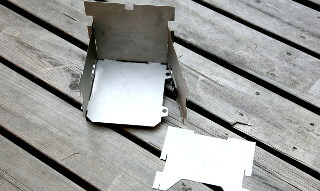 To assemble, first attach the two sides to the back. Spread the sides a bit to insert the bottom. Finally attach the front, which locks everything else in place. Here's the stove in use, burning dry twigs. It can also be used with a Trangia spirit burner, which may be used indoors or under a tent flap, but the less fuel you need to carry with you, the lighter your backpack will be. 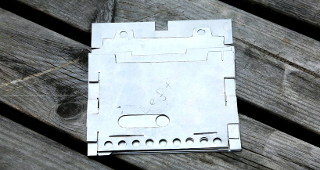 If you want to make your own stove, here are the drawings. (Sorry the dimensions are missing! But if you print onto A4-size paper, the drawings will be actual size.) If you can't obtain titanium sheet metal, try stainless steel (but not galvanized steel, as the zinc it's plated with is toxic). Aluminum is fine if you will only use a spirit burner, but it will melt if you burn wood in it. It should be ok for hexamine/Esbit fuel, though, since even beer can aluminum will withstand that heat. You do know the nasty byproducts formed when hexamine burns, right?